"Any real band can't bank on such a thing; you can't be ready when it happens." >ARCADE FIRE with DAN DEACON, KID KOALA. 7:30 p.m. Wed., March 12. Musically, Arcade Fire has long been a big band. Its signature is to build songs into momentous crescendos, until the sound waves themselves practically have physical mass. As the six-member group swaps instruments in and out and with each other like kids rummaging around an unsupervised band room, a theme will emerge, growing more and more massive until it inevitably explodes and fades away. Now, though, the band is big in a more conventional sense, too. The band's latest album, Reflektor, released Oct. 28, opened at No. 1 on the Billboard 200 and moved 140,000 copies in its first week. The supporting tour finds the band hitting giant arenas (like Pittsburgh's Consol Energy Center) and headlining festivals (like Coachella). 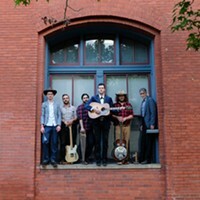 The previous album, 2010's The Suburbs, also debuted at No. 1 on the Billboard 200 on its way to winning the 2011 Grammy for Album of the Year. Even the score the band co-created (along with Owen Pallett) for Spike Jonze's Her was nominated for an Oscar this year. This is the algorithm of making it: one day you're nobodies from Montreal; the next, you have David Bowie doing a guest vocal on the lead single for your new album. "Bigness wasn't the goal; it was an accident," explains multi-instrumentalist and composer Richard Reed Parry. "Any real band can't bank on such a thing, you can't be ready for when it happens, there's no real book on how it happens, no identical scenario, there's no roadmap to show us how to adjust to it. ... I think we are constantly trying to find ways to be comfortable; this is a thing we have to adapt to." On the practical side, this means the rhythm is emphasized: There are congas, four-on-the-floor disco beats, kick drums that thump instead of attack, bass and synth bass that are always on the verge of distorting, a mix that makes you constantly aware of percussion, and songs that are allowed to stretch out, to keep you sweating out on the dance floor. 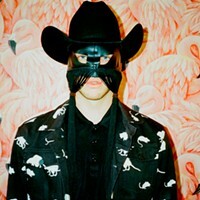 On this fourth album, Arcade Fire wants you to dance ... and they want you to dress up. Those interested in purchasing a ticket for the upcoming Consol Energy Center show through Ticketmaster's website are met with the message, "NIGHT OF SHOW: please wear formal attire or costume" — it's even stamped on the ticket. The dress code is voluntary (a lack of a cummerbund will not be grounds for removal), but this situation illustrates a band adjusting to its newfound size: The intimacy of club shows is history, but having the audience dress up is an attempt to get people to invest in the show. "You don't have to dress up for Halloween," Parry says, "but let's see if anyone gives you candy." There comes a point when a band gets too big to relate to; there's a shift that permanently separates the band from the people who follow it. 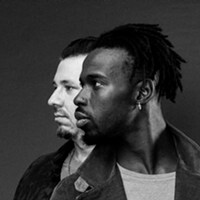 The reference points the band sings about are too unfamiliar for a normal person to understand and the members' life experiences become too extraordinary. Reflektor is a study in relatability; it suggests the members of Arcade Fire are, consciously or not, aware their band's burgeoning size is separating them from normalcy. "Flashbulb Eyes" and "We Exist" concern the soul-stealing and objectifying qualities of fame — something none of us can relate to. "Normal Person" questions if it's possible for the song's topic to even exist. Its single, "Reflektor," studies the most terrifying fate of all: a gradual separation of loved ones who eventually become strangers to each other, a lost relationship (with the fans? with each other? ), the post-explosion fade-out. There's a theory in physics wherein "The Big Bang" is followed by "The Big Freeze" — as the universe expands, objects become farther away from one another. The explosive transference of electrons that fuels all physical creation begins to cease; the universe gradually cools until, ultimately, all life ends. Creativity is fueled by collisions, conflicts, and, most importantly, closeness. This is why adjusting to largeness is the theme of Reflektor, this supporting tour and this stage of the Arcade Fire's career. Success begets largeness, yet success requires conflict. 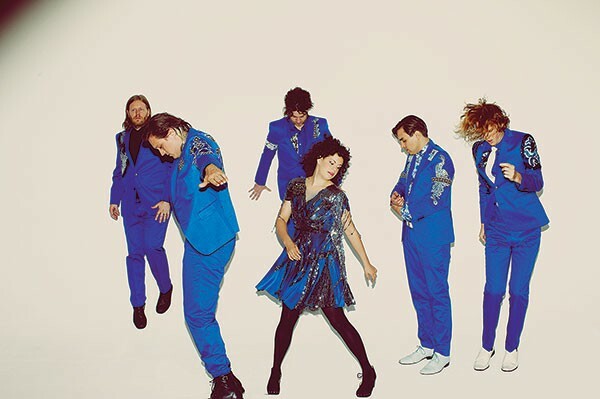 Arcade Fire "is a six-way marriage; opinions clash, feelings get in the way, and a lot of wills are competing," says Parry. "The process is still taxing and challenging 10 years in ... but conflict is good. We have six creative, brilliant musicians working and fighting with each other, but when we come to an agreement and we make something that works and is great, the whole is greater than the sum of its parts."